The ApacheBench software I initially used for round 1 and round 2 is very good to get started with. But there are better tools that allow to have more detailed reports and insight into the load test. Another strong reason was that ApacheBench only support HTTP/1.0. 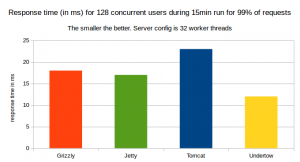 The lack of support for HTTP/1.1 may have a negative impact on performance. Switching to Gatling gave me more flexibility and also allowed to generate pretty graphs and more detailed statistics. This will also allow anybody with Java installed to be able to run the tests without having to install any additional software. One of the issues pointed out by Stuart in his comment is that the response header for each container was different. Most importantly, Grizzly was sending the least header i.e Grizzly was transmitting less data than the other 3 containers and this certainly has an impact on performance and response time. To address this, changes have been made so that every single container is returning the very same response header. Since Grizzly by default would not allow to add the Server HTTP header to the response, I had to implement a filter to allow for that header to be added to every response. Another issue mentioned by Stuart is that ideally we want the HTTP containers being tested and the load generator to be on separate servers. This has been addressed too. This leads us to 2 machines in the very same Local Area Network. In round 1 and round 2, I was warming up the HTTP containers with a single HTTP GET request. As suggested by Stuart, I am now doing a full 10 minute warm-up before running the real load test for 15 minutes. As show on the graph, Grizzly has shown the best through output, followed by Undertow. Here, we have Undertow leading in term of response time for 99% of requests. 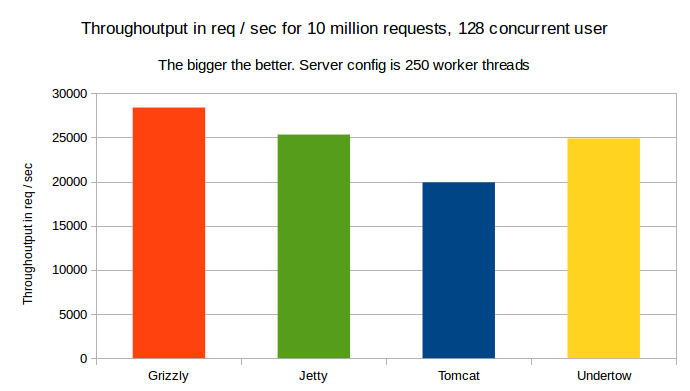 Undertow and Grizzly have very similar performance here. Note that Grizzly remains a very interesting beast. 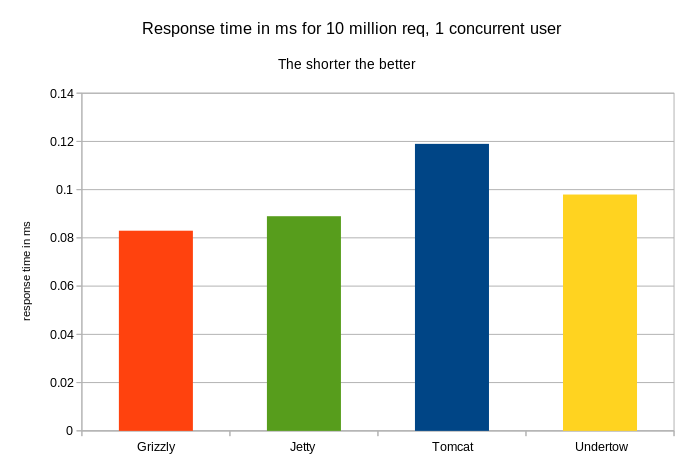 Despite the 10 minute warm-up, the response time was still high during the first 6 minutes of the load test, then response time suddenly dropped down from above 100ms to under 30ms and remained lower… Just as if Grizzly has an internal cache. No other container has shown such a behaviour. have shown totally different results from what we got in round 1 and round 2. As shown in previous tests, Grizzly seems to perform best but here, we have learnt that Undertow can come very close. Given that Undertow is a fully blown Servlet Container with support for the latest Servlet spec, JSP, JSF etc, it is an excellent choice for complex web applications. This is a follow-up to the initial REST/JAX-RS benchmark comparing Tomcat, Jetty, Grizzly and Undertow. 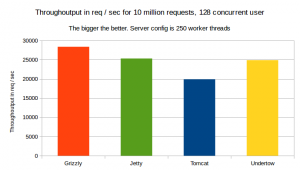 In the previous round where default server configuration was used, the race was led by Grizzly, followed by Jetty, Undertow and finally Tomcat. In this round, I have set the maximum worker thread pool size to 250 for all 4 containers. 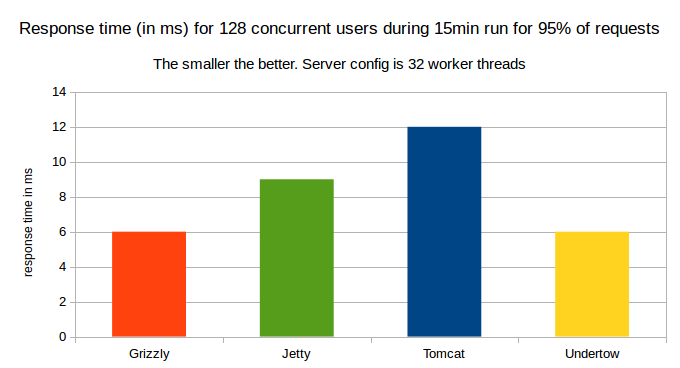 To make this happen, I had to do some code changes for Jetty as well as Grizzly as this was not possible in the original benchmark. 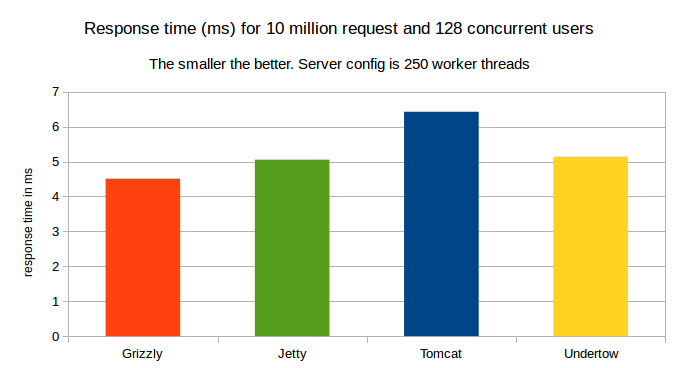 This allowed me to start the container with the thread pool size as a command line parameter. For more detail about running the tests yourself, please have a look at the github link in the resources section. 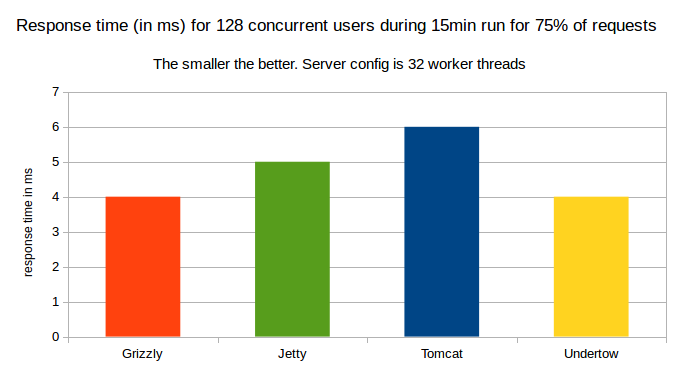 Note that here, we have more free ram than in the previous round as I have shut down all running applications. As shown on the graph above, as fas as tough output is concerned, again, Grizzly is far ahead leading the race, followed by Jetty. Undertow came third very close to Jetty. Then Tomcat came last. 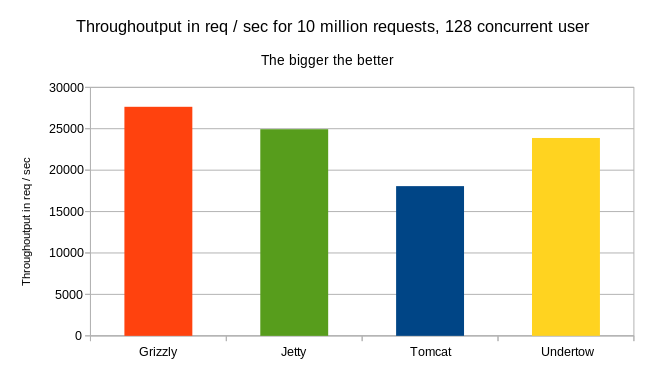 The result of this round 2 is very similar to what we have seen in round 1: Grizzly is the fastest container when it comes to serving JAX-RS requests.